PORT HARCOURT – Leaders of the oil rich South-South region of Nigeria have enjoined the Federal Government to take the issues of restructuring of the nation seriously, stressing that change should begin with the restructuring of the country. The regions also demanded a new constitution that would define the powers of the federal government and the federating units, adding that restructuring of that would strengthen the nation’s unity. This is just as the Governor of Rivers State, Chief Nyesom Wike, told the region’s leaders that the Presidency and the ruling party at the national level, All Progressives Congress, APC, are not true to restructuring the country. These were the resolutions and positions of the leaders of the South-South Geo-political zone, yesterday at its summit in Port Harcourt organized by the Project Nigerian Movement. The conveners of the summit are His Excellency Obong Victor Attah, Prof Kimse Okoko, His Excellency Donald Duke, Chief Idu Amaidhe, Chief Solomon Asemota (SAN), OCJ Okocha (SAN). Speaking, the first governor of old Rivers State, His Royal Majesty, King Alfred Diete Spiff, noted that the problem of Nigeria started when the military modified the nation’s constitution of 1960 in 1979 when they gave power to former President Shehu Shagari. Spiff, who chaired the summit noted that the nation needs a constitution that would be written by the people to favour their interests, adding that it was time to overhaul the entire governance system of the nation. He urged president Muhammadu Buhari to give ears to the calls from different ethnic nationalities of the nation on restructuring if he (Buhari) is actually bent on changing the nation for good. Meanwhile, the governor of Rivers State, noted that report of the All Progressives Congress, APC, committee on restricting, headed by the Governor of Kaduna State, Mallam Nasir El-Rufai was politically designed to deceive people. Wike, who spoke through the State Head of Service, Mr. Godwins Rufus, noted that for the decision of the APC to have come close to the general elections showed that it was political. “Wike said: “We should not be confused by the report of Governor El Rufai’s on restructuring of the country. This coming close to the election shows it is a trick by the APC. Wike maintained that restructuring of the nation cannot be achieved by the APC led federal government, stating that restructuring would institute the expected development. Also, the former governor of Akwa Ibom State, who is a co-convener of the summit, Obong Victor Attah, noted that what the region is demanding at the time is a return of a Nigerian that works for all. Attah said: “Restructuring must not therefore be seen as a demand for a previously known Nigerian, what we demand is a return to a Nigerian that we have had before, a Nigerian that worked for human progress and development. 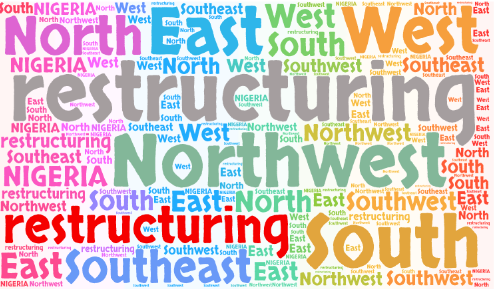 The post Change begins with restructuring, S-South leaders tell FG appeared first on Vanguard News.